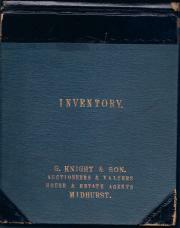 [ 'Knight's Juvenile Library': book with coloured frontispiece. ] The Life and Adventures of Thomas Titmouse, And Other Stories. By Peter Parley, Author of "The Wanderers by Sea and Land," etc. 64 + 16pp., 16mo. In blue cloth binding, with cover design stamped in gilt. All edges gilt. In fair condition, aged, worn and shaken, with rear endpaper torn away. Coloured frontispiece showing 'The Soldier and the Blind Fiddler'. At rear is a sixteen-page catalogue of 'Books for the Young, Published by Knight and Son, 12, Clerkenwell Close.' Now scarce: although there are 10 copies on WorldCat (where the book is ascribed to Goodrich, and dated), none of them, or on COPAC, are noted as being in Britain. On letterhead of the University Arms Hotel, Cambridge. 7 August 1902. 2pp., 12mo. On bifolium. In fair condition, on lightly-aged paper. In addition to the message he left for the recipient's guest 'as to Carnegie', he asks him to tell his father-in-law (the London parliamentary bookseller P. S. King?) 'that it will be a very great favour if he sends me, to glance over, those letters he spoke of'. He undertakes to 'return them at once', and gives his address in Aberdeenshire for August and September. He has 'called twice on the chance of seeing Mrs. Roberts to say Goodbye', and asks the recipient to 'say it for me, in kindly fashion'. [P. S. King, London Parliamentary Bookseller.] 36 items from his papers, including correspondence from individuals including the Bishop of Chichester, Sir Charles Bowyer Adderley, Sir Edward Cholmley Dering, William Knight and other public figures. Mainly from London and Westminster. Dating from between 1855 and 1907. The notable London firm of P. S. King & Son, 'Publishers, Parliamentary and General Booksellers, Bookbinders and Printers', was in existence for more than a hundred years, having been established, according to its own account, in Parliament Street in 1819, and still active until 1941, when it became P. S. King and Staples, under which name it traded for around six years. (An advertisement for the Staples Press Limited in The Times, 14 February 1946, lists, among incorporated companies: 'P. S.
236 pp, 8vo. In sturdily-bound landscape account book by Drake, Driver & Leaver of London, with black leather half-binding, green cloth boards, and marbled endpapers. Stamped in gilt on front board: 'INVENTORY. | G. KNIGHT & SON. 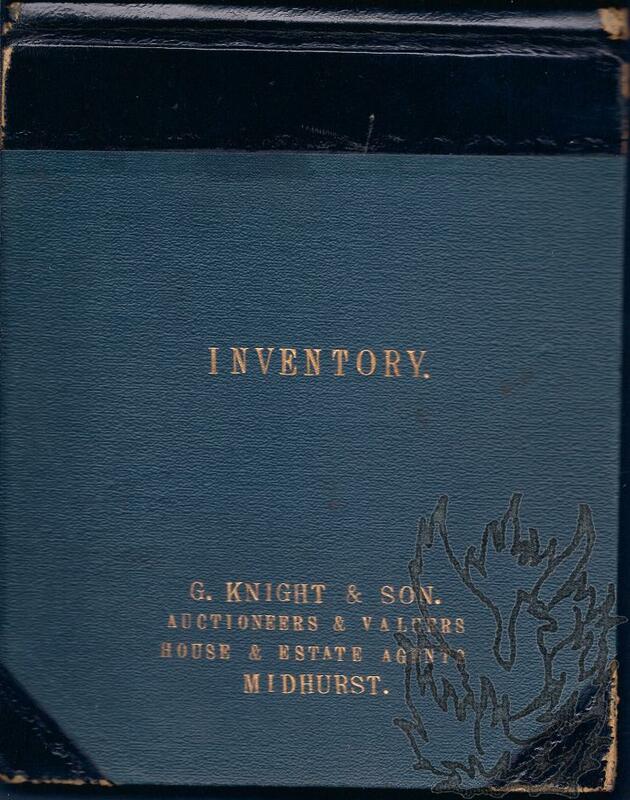 | AUCTIONEER & VALUERS | HOUSE & ESTATE AGENTS | MIDHURST.' Good, on aged paper, in lightly-worn binding. Lined lengthwise across each two pages (like an oversized reporter's or policeman's notebook), each opening carrying a stamped number, and with the text on openings 1 to 119 of the 251 in the account book. Galley proofs of Damon Knight's 1962 anthology 'A Century of Science Fiction'. New York: Simon and Schuster, Inc., 1962. 126 galleys, numbered in type, each 60 x 15 cm, and containing the text of two pages. Text clear and complete. On aged paper, with fraying and light staining to some extremities. Red Simon and Schuster label, with typed publication date and price, on reverse of last leaf. Under seven headings from 'Robots' to 'Marvelous Inventions', and featuring the work of authors from Jules Verne to Brian W. Aldiss. Introduction and linking passages by Knight himself. Although present in the proofs, one story - 'The Mindworm' by C. M.
Cyclostyled signature ('Laura Knight') on receipt. On blue paper 10 x 18 cms. Good, with trace of previous white paper mount on reverse. Printed receipt, filled in in manuscript. Reads 'No. 5, VIGO STREET, | W.1. | [June 2nd 1937] | Received a DONATION of [One Guinea] | from [The Misses Ruck] | for the ARTISTS' GENERAL BENEVOLENT INSTITUTION. | £ :  | [-] | [next word deleted] Secretary | [next two lines cyclostyled in purple ink] most gratefully | Laura Knight'. Autograph Letter Signed to C. H. Grinling with presentation copy of his pamphlet 'Spiritual evolution in South Africa'. Letter dated 2 November 1946, on University of Witwatersrand letterhead; pamphlet printed in Johannesburg and undated (but inscribed by recipient 'C H. G. | Dec. 4. 1946'). THE PAMPHLET: 8vo, 21 pages, in original blue printed wraps. Somewhat dusty and bumped in one corner but in good condition overall. Inscribed on title-page 'With the good wishes of the author'. THE LETTER: 1 page, 8vo. Grubby and with jagged closed tear to one edge not affecting text. He thanks him for the note '& the enclosures with their prophetic words. How slow the material world is to react to the vision of its seers!' He hopes his 'little essay' will be of interest. He concludes 'Patrick Duncan was the only Milner man I knew & he, of course, has passed over.